Ever since I first caught sight of this sheet advertised in Scale Aviation Modeler International, I wanted to get a hold of it. 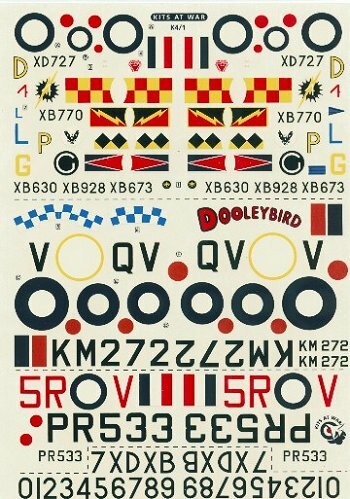 The mustang scheme offered the aircraft ; “Dooley Bird” took me back to one of the first kits I slapped together and zoomed around the house as a youngster—The 1/72 scale Matchbox P-51D Mustang. But where to find “Dutch Decals”? I finally found this one in the catalog of Flightdecs out of Thunder Bay, Ontario and snapped it up and pile of other interesting things as well…but onto the sheet. 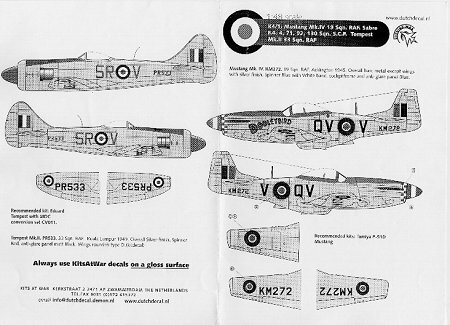 This sheet is quite interesting in that it includes an option not only for the aforementioned Mustang and a Handful of Sabres-very common subjects, but also for a silver Tempest II from 33 Squadron in Kuala Lumpur. There is unfortunately not an out-of-the box kit available for this, but the sheet recommends using the Eduard Tempest kit along with the conversion available from MDC out of the UK. 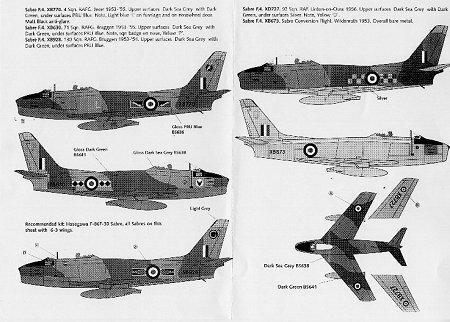 The five Sabre options are all Canadair Mk 4 versions, so here you have the choice of using either the Hasegawa or Academy kits with the 6-3 wing. There are three a/c; nos. 4, 71, and 130 Squadrons with the Dark Sea Grey/Dark Green Camouflage over PRU Blue scheme. The 92 squadron aircraft is a little different in that has the same Grey/Green camo over a silver bottom. Finally there is a somewhat plain looking Sabre in overall Natural metal from the Sabre Conversion Flight, 1953. …and now we get to my favorite-- “Dooleybird”. This is an overall natural metal P-51D the from 19th squadron RAF in 1945. It has a somewhat unique and very attractive bright blue anti-glare panel and canopy framing. There is also a blue and white checkered pattern on the cowl and a blue and white stripes on the spinner. The kit recommends the Tamiya Mustang, but I’m sure either the Hasegawa or even a Monogram kit would do just as fine. Needless to say I am very much looking forward to building this option—and with paint this time! I do have a couple of negatives to point out on this sheet. It does not really show up in the scan, but the dark blue on the roundels and fin flash is very dark. In the case of the Sabres I would say it is actually closer to black than blue. I can’t say if it is a problem on all the sheets but as a result I am possibly considering searching out some different roundels. They may however look “right” on the model. There are also no stencils provided, however this should not be a great problem. All in all it is a nice looking sheet that will be of great interest to anyone interested in the RAF.